i-memorize Sheet: About "i-memorize Sheet"
"i-Memorize Sheet" is a rote learning app which enables you to hide words and years you want to memorize with the filter. "i-Memorize Sheet" implements the same effect of the red filter sheet with the image analysis function. For this reason, characters written in red color or check marker of green in the reference book can be hidden by just taking a photo. In other words, things have been learned by using the memorization sheet are now available on your device. It's also possible to convert the whole reference book into PDF and capture it. With an iPhone, rote learning is available anywhere and any time. Red colored section does not just disappear but it is of course possible to grant a marker on your own. 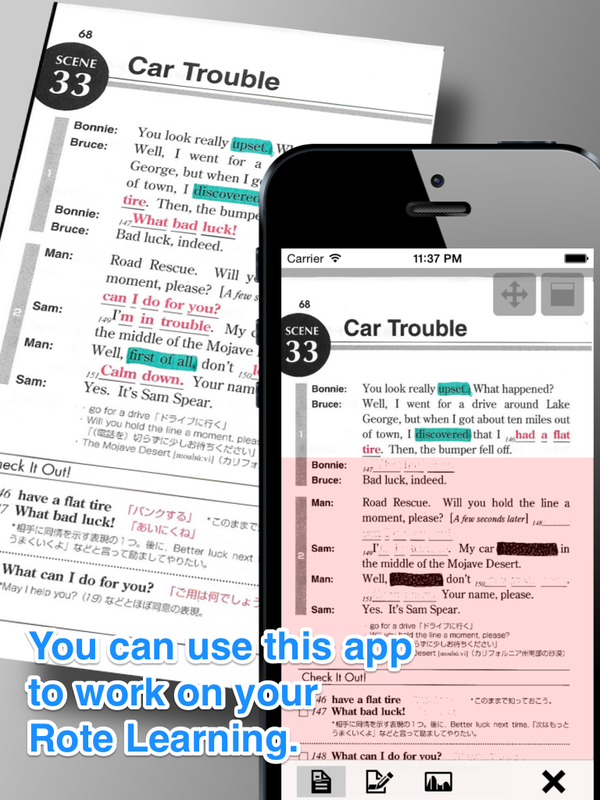 "i-Memorize Sheet" recognizes the characters as well as their widths and location. Therefore, you can make a marker simply by tracing the text string. Detailed operations like setting the width of marker and specifying the four corners are not required. You just mark the text string you want to capture.